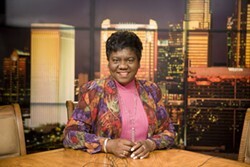 Thompson, the public affairs director for WBAV 101.9 FM, has her finger on the pulse of Charlotte. And thanks to her microphone and voice, Charlotte radio is saved from totally sucking. Thompson has been a journalist in the Queen City for more than 30 years, knowing what topics need coverage and what the community will respond to. If shes not interviewing the movers and shakers in the city, then shes highlighting community events that you wont see on the nightly news  in between songs by Souljah Boy or T-Pain.